You could lament lack of infrastructure, ambition, initiative or sheer hunger but the likes of Neeraj Chopra and G Lakshmanan are marching through the swamps armed with just their talent and a relish for the big stage. On the last day of the Asian Athletics Championships, in front of a roaring, cheering crowd of 10,000, both brought a touch of class and keen competition. For the fans, who had probably never seen a combative javelin face-off experienced exactly why Neeraj Chopra is rated so highly. 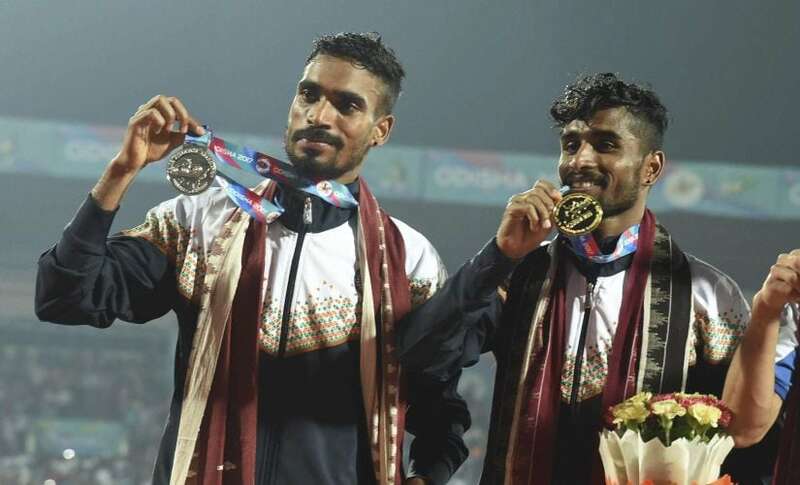 The Junior World Champion and the new poster-boy of Indian athletics didn’t let fans down as he came back strongly after a poor start to decimate rivals on his last throw and pick up the gold. 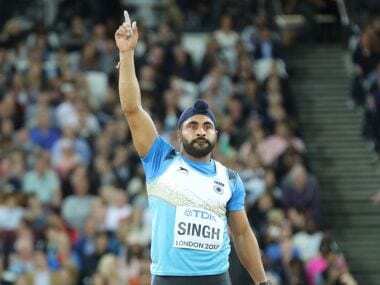 In fact, the top three finishers which included Davinder Singh Kang broke the meet record of Japan’s Y Murakami (83.27m) set in 2011. After the 800m disaster where Tintu Luka didn’t finish the race and then Archana Adhav was disqualified after finishing with the gold, Neeraj’s first throw was a foul. It didn’t augur well. The javelin is a technical event that mixes power with the perfect throwing arm and ability. Neeraj’s release angle and the speed was not where he would have wanted it. “I knew I was doing something wrong in my first three throws,” said Neeraj later. In fact, his 2nd and 3rd throw were a disappointing 78.59m and 78.54m. In the throws, it’s slightly easy to comeback as just one throw can bring all the co-ordination back – especially the angle of release with the prevailing wind. The Kalinga Stadium is not your typical circular stadia. Towards the throwing end, the walls don’t jut up. And with a lack of wind speed on Sunday, throwers needed more power and rhythm. Davinder Singh Kang, under a dope cloud after testing for marijuana recently, was lucky to be competing at all. Marijuana was found in his urine sample collected during the 3rd Indian Grand Prix athletics championships in Delhi on 15 May. The suspension didn’t come about as marijuana falls under the “specified substance” category in the World Anti-Doping Agency’s (WADA) prohibited list of the performance-enhancing drugs. Kang was allowed to participate by the Athletics Federation of India. And with a second throw of 81.56m, he had thrown the gauntlet to the rest of the competitors. Qatar’s Ahmed Ahmed Ba threw 81.53m and the fans were just getting warmed up. Javelin events sometimes take up to two hours and it’s only after the first three throws that the crowd gets behind their favourite. Neeraj opened up the contest with his 4th throw of 83.06m, pumped the air to walk confidently back to the bench. The rhythm was back. Kang stood at the top of his mark, asking fans to start cheering. His 4th throw was almost perfect in its execution and landed at 83.29m. The contest was now on between India’s top two throwers and with Qatar’s Ahmed in the mix, this only promised a fiery end. Chopra’s fifth was a disappointing 80.99m. The Haryana youngster was staring down the barrel. Both Kang and Ahmed were ahead of him. Chopra, 5th in the Diamond League in Paris before landing in Bhubaneswar didn’t come to the AAC to walk back with a bronze. 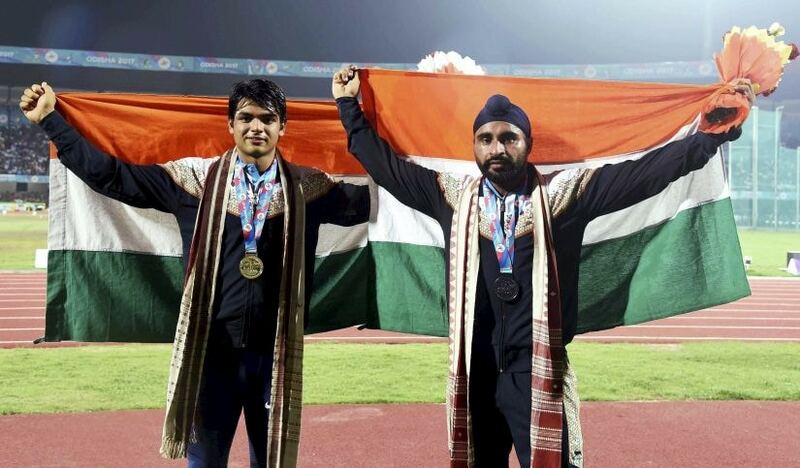 “At that moment, I knew it had to be the last throw or the gold was gone,” said Neeraj later. Ahmed and Kang had already broken the Meet Record of 83.27m of Japan’s Murakami set in 2011. Now it was up to Chopra’s last throw. Waving his arms, he got the fans into the act. The run was perfect. The back foot taking the force as Chopra released the spear. For a second it appeared that the force wasn’t there. But the arc built up and the javelin’s aerodynamics came into play. Recovering from his follow through, Chopra knew instantly that this was a Big One. As the spear landed, he punched the air and did a skip and jump. After an excruciating delay of ten seconds, the scoreboard flashed 85.23m. The Champion had delivered; when it mattered. Kang still had a throw. The Army man could pull out a rabbit from his hat. In the Grand Prix at Patiala, Kang had thrown 84.57m. Could he go further? Everything seemed perfect in his run-up. But 80.29m wasn’t really enough to change the scoresheets. Neeraj Chopra, Indian javelin’s top seed had won the gold; his 2nd big international medal after the win at the Junior World Championships. At the moment, form and his state of mind seem perfect for his entry on the world’s biggest stage – The World Athletic Championships. Kang was disappointed. For a moment, especially after throwing 83.29m, he must have believed that he could be in the top two and probably push for gold. “My shoulder was an issue,” he said, his words laced with disappointment. “But believe me, I will throw 90m plus at the World Championships and I will be on the podium.” That’s almost 6 metres plus above his personal best. Throwers thrive on speaking their mind. Hopefully, Kang and Chopra can give us another duel and to see two Indian javelin throwers in the mix with some of the world’s best at London will be a big step for Indian javelin. G Lakshmanan’s golden run in the Asian Athletic Championships continued with a brilliant run in the 10,000m. Through the run, he never seemed uncomfortable and in fact on the 10th, 14th and 21st lap even exchanged the lead with Gopi Thonakal, the eventual silver medalist. With a mix of 13 runners, not a huge field, it was about consistent running for Lakshmanan. And he led from the start, except for the first few laps where he stayed in a group of five runners before his, Thonakal and Kyrghizstan’s Adilet Kyshtakbekov’s pace proved too much for the rest. On the 25th and last lap, Lakshmanan sprinted away in the last 350 metres to win his second gold of the championship with ease. Earlier, he had won the 5000m. In the Federation Cup in Patiala, he had also won the long-distance double. Swapna Barman also clinched the hepthalon gold after a rousing run in the 800m. “I am so happy that I can compete against the world’s best in London,” she said. “It was difficult in the conditions but I kept at it.” Swapna’s final tally was 5942 points with Purnima Hembram picking up the bronze with 5798. If the men had a great run, the women with a timing of 3:31:34 qualified for London too. There was a moment when Jisna Mathew and Nirmala Sheoran created the ‘baton suspense’. Mathew ran a wonderful 3rd leg after a powerful 2nd lap by MR Poovamma but in the baton exchange lost around three seconds before she could hand it over. The lead which was comfortable at around 6 to 7 metres was whittled down but Sheoran didn’t let the pressure get to her and closed out the race with a powerful finish. Shoeran, apart from the relay will run the 400m flat also at the London World Championships. With a haul of 12 golds, 5 silver and 12 bronze for a total tally of 29, India sit on the top of the heap. India’s brilliance was manifest in the mental struggle and when athletes push past the pain barrier, a bunch of gold usually is the net result.